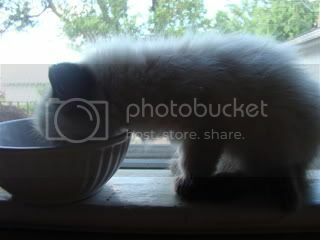 This entry was posted in Buttercup and tagged Buttercup, kitten, stray cat. Bookmark the permalink. LOL, thanks Joy! I am going to post some interesting photos of our other resident cat…Houdini. How sweet is she! Is she named after the main character in Princess Bride? I love that movie. And Houdini is a cutie, too. I thought you’d shaved him on purpose for summer – he seems to be enjoying it. Lewru…well I would have shaved him for summer, but I could not get him in to the groomer. Not many around here take cats and my clippers were acting up. He was so matted, that I was having to cut chunks off of him. When he had his surgery from getting hit by a car (or at least that is what we think happened), I asked the vet to sheer off what he could. Blondie is in dire need of a buzz cut also! What a Cutie!!!! 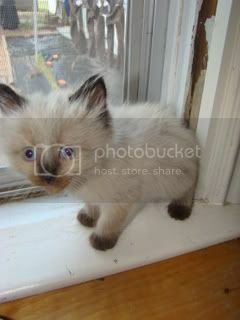 I love Siamese and kittens as well, combined they are perfect! I would have kept her as well. I have 2 cuties of my own, rescued from a ferrell cat rescue.